The Lord’s Entry into Jerusalem. 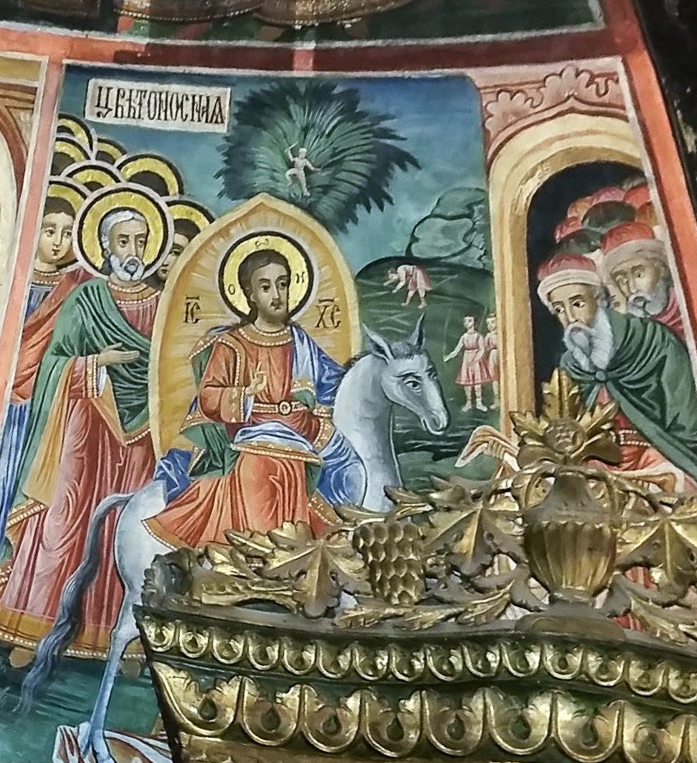 A fresco from Bulgaria. On Palm Sunday of the Passion of the Lord, the church gathers throughout the whole world to recall the entrance of the Lord into Jerusalem to proclaim Hosanna to the Son Of David! After we hear the proclamation of the Gospel of the Lord’s entrance from the Gospel of Matthew [Mt. 21], we unite our voices with jubilant voices of the children of the Hebrews who spread garments on the road. we may also have a share also in his Resurrection and in his life. The hymn commemorates joy, and we have the jubilant incensation of the altar; but the tone quickly changes from jubilation to sober reality: the Messiah must suffer and die. We go straightaway into the first reading from Isaiah, one of the Songs of the Suffering Servant, “I gave my back to those who beat me.” [Isaiah 50:4-7] The suffering servant songs can be the core of our Holy Week meditation: Palm Sunday: Isaiah 50:4-7, Monday: Isaiah 42:1-7, Tuesday: Isaiah 49:1-6, Wednesday: Isaiah 50:4-9, culminating with the final Servant Song on Good Friday, Isaiah 52:13-53:12. The ancient prophecies set forth that the Messiah must suffer and die, a Messiah who in words of the second reading from Philippians, “humbled himself, becoming obedient to the point of death, even death on a cross.” Christus Factus est, as the cantor chants before the proclamation of the Passion, a proclamation with neither candles nor incense, only setting forth that our salvation has been purchased with the costly shedding of the blood of Christ. When Jesus cries out in a loud voice and hands over his spirit we kneel to humble ourselves before so great a mystery. Holy Week is rich in music as well. At this link is a collection of videos of music for Holy Week. This entry was posted in Faith, Lent and tagged Egeria, Lent, Palm Sunday, palms, procession on March 20, 2016 by frjfkauffmann.